William Aylward's name doesn't stand out in the annals of illustration. Yet, if you skim through old pictures in books or magazines, his work stands out from hundreds of other anonymous illustrators because he was such a master of value-- the darkness or lightness of color. Try it yourself -- if you scroll through a hundred thumbnail images, you are likely to find that the pictures with confident use of value-- more than other artistic qualities, such as accuracy, color, detail, or technique-- are the ones that seem to pop right off the page. It is not easy to control the "value structure" of a painting, balancing blacks and whites and grays. This next picture could easily have sunken into a black hole if Aylward had not been such a virtuoso. Aylward loved the sea and specialized in nautical themes. 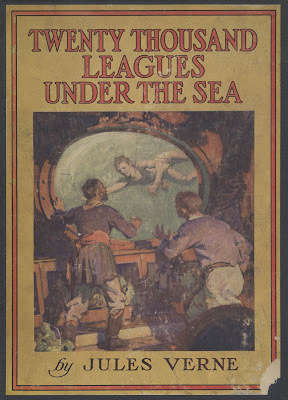 He illustrated very few books, primarily The Sea Wolf and Twenty Thousand Leagues Under the Sea. Most of his work appeared in magazines of the day and will never be republished, which is too bad. You won't see any coffee table books about him soon. But his work still speaks for itself with honor and dignity. David, thanks very much for showing Aylward's work. He was one of the true masters of Pyle's modern approach to pictorial composition and the idea that a good composition should knock you over at ten paces. As you say, his work has fallen into obscurity (as has much of the original Pyle coterie of students). I suspect that Walt Reed would be the best repository of the work from this marvelous era. For serious students of illustration, Pyle was the font from which the new vision flowed. Having said that, Aylward makes the breath catch sometimes, like Homer. There's a number of stunners on the 100 years of illustration blog. Aylward seems to have been lost in the cultural shuffle towards "city sophistication" of the 1920s, like so many other "rugged" Pyle-trained artists. And, it seems, only N.C. Wyeth was left standing as "illustrator of the wild". And even he became inconsistently interested during this time. I guess the movies took over the field of rugged adventure, or the Sunday Funnies, or the pulps, or the radio serials, or the fact that there was simply too darn much of it, spilling out all over the place. And then it wasn't Eugene O'Neil enough. Even Dunn seemed to prefer teaching after a while. But the work is so good. Sometimes I forget how good it is. Thanks for reminding me. These drawings are stunning. I like your blog very much. What a powerful illustrator! Thank-you so much for sharing Mr. Aylward with us! Thanks for sharing these with us, great stuff. Once again, you either remind me of someone great I haven't thought of in awhile or, in this case, someone I have never heard of...and I have owned a ton of Illustration Annuals! Rob and Kev, it warms my heart to hear from people who understand and appreciate the contribution of the great Howard Pyle. He was a seminal figure in American art. When he began his extraordinary school, he received hundreds of applications from around the country for every opening. The results show he chose wisely. Rob, you are absolutely right about Walt Reed; he is the fountain of all information in this field (as well as my source for those first two paintings). Kev, I feel the same way. 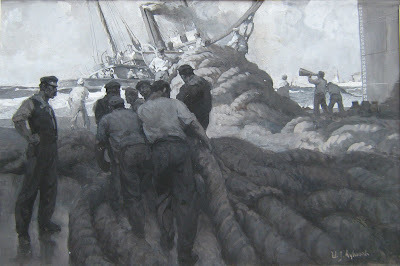 It is sometimes easy to forget Aylward because it is so hard to get quality images of his work these days. But boy, if you flip back through those old magazines, you can spot him right away. Lucie and Haylee, thank you so much. I appreciate your writing in. Thanks, Tom. I enjoy the classic images on your blog. It's always a treat to see pictures that haven't been published elsewhere. Ken, those illustration annuals from the Society of Illustrators are a great resource, but of course, before the 1950s there wasn't much to record the comings and goings of illustration talent like Aylward. Those art director annuals just weren't the same. Pyle isn't all that well represented with books/images so I'm not surprised Aylward is so obscure. It's a shame because I think a lot can be learned from the work of Pyle's students. I read that Aylward was an official army artist during WWI...I'd love to see those paintings! The truck convoy ain't shabby! Aylward is one of my favorites. It took me a couple years of diligent searching on eBay for old copies and bound volumes of Harpers and other magazines to find enough images to include him in my History of Illustration curriculum. 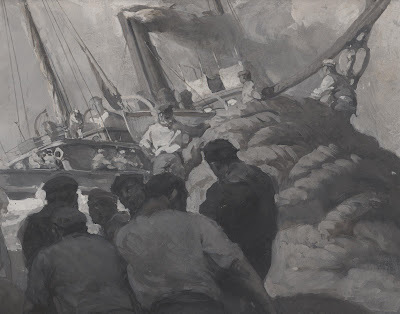 Now one of the best ways to find images by Aylward and other students of Howard Pyle is to get a subscription to Harpers Magazine, which includes access to their online archives - every issue going back to the first. Lots of Pyle and his students - especially Elizabeth Green - to enjoy. 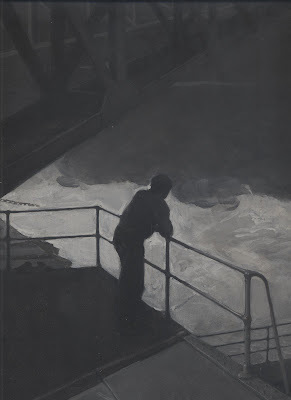 By the way, there is a new book on Allen Tupper True available, focusing primarily on his mural work. Good point, David. I guess the annuals have been around so long, I tend to think of them as the bibles of illustration. I was lucky enough to find a great book, "40 Illustrators and the way they work" (or something like that) and it includes some of the classic illustrators of the 50's era. I love those old editions of kids' books. And they aren't that rare (except in good condition, because kids like me were holding onto them). My family's always had a connection with the arts, and I shudder at the stuff I was casually leafing through or cutting pictures out of (no, I didn't actually do that!) when I was a kid. Too bad the internet wasn't a better resource for these older names, but there are some sites (I can't think of the names at the moment). Thanks for sharing these images. As always I am in awe of what you have put together here. Very inspirational! Pete, dfernetti and Steven K, thanks for the additional input on Aylward. One of the great things about this blogging business is the chance to bundle together info on under appreciated artists. rachete, thanks for writing. I took a look at your blog, and was especially pleased at your work on behalf of children. Keep up the good work! Kenmeyerjr, that "40 Illustrators" book is a great one.